An estimated 8,300 million metric tonnes of plastic has been produced by human industry since 1950, with an estimated 79% having been accumulated in the environment in either landfills or as litter. This means that global human activity has placed an estimated 6,557 million metric tonnes of plastic into direct contact with our environment. If our current rates of plastic production and disposal continue, it is estimated that the volume of plastic in the ocean will outweigh the volume of sea life by 2050. Our oceans are forming islands of waste and we’re facing the unprecedented death of wildlife. Plastic is so rampant we’ve even begun to eat it ourselves, with studies suggesting that 93% of bottled water – which is often filtered municipal water – contains microplastic contamination. Our environment sustains all life; it should be enjoyed and needs to be protected. We need waste-free oceans, parks and beaches. We find ourselves in the eleventh hour - and there is no time to lose when it comes to reducing waste. We must act now to stop plastic ending up in our environment, with our marine environments of greatest concern. The effect of plastic on our environment is horrific, and especially senseless in light of the available alternatives. Given the persistence of plastic waste and its tendency to form microscopic particles, reducing the input of plastics to the oceans seems to be the most viable strategy. 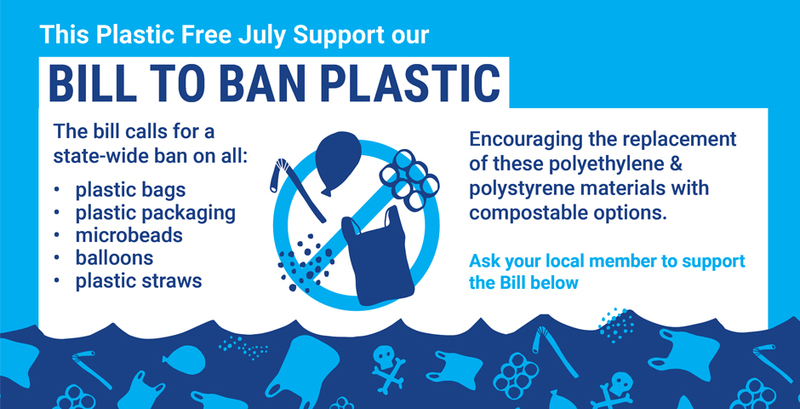 The Greens (WA) support restricted supply of plastic bags, balloons, plastic drinking straws, and polyethylene and polystyrene packaging. In addition, the Greens (WA) support the prohibition of products containing plastic microbeads throughout the whole of Western Australia. There has been a clear groundswell of community action, with individuals, community groups and businesses taking responsibility over waste reduction. In March 2018, The Greens (WA) environment spokesperson Robin Chapple tabled a petition with over 2000 signatures to parliament calling on members to pass his Bill to ban single-use plastics. Working collaboratively with Sea Shepherd Marine Debris Campaign Australia to collect signatures, Robin Chapple MLC notes the ban would limit wasteful single use plastics from entering both landfill and the natural environment by creating a environmentally-sound choice for consumers. Following proposed ban on plastics by the European Union in May 2018, The Greens (WA) waste spokesperson Robin Chapple introduced the Environmental Protection Amendment (Banning Plastic Bags and Other Things) Bill 2017, targeting single-use plastics, with appropriate exemptions regarding medicine and access issues. The Greens’ (WA) Bill was successfully passed - a significant step in the reduction of plastic waste. The legislation came into effect on the 1 July 2018 and saw a ban on the supply of lightweight plastic bags - including bags that are biodegradable, degradable or compostable - with handles 35 microns thick or less. The State-wide plastic bag ban applies to all retailers, not just supermarkets. However, penalties for retailer non-compliance with the legislation did not come into effect until January 2019, which resulted in a further six months of unhindered plastic pollution, punishment free. Thicker plastic bags are worse for the environment, taking far longer to break down than lightweight plastic bags, putting our marine life at increased risk of ingestion. Quebec recycling group, Recyc-Quebec conducted a study (available here) which demonstrated for the thicker plastic bags to be more environmentally sustainable than the thin bags, they must be used three to six more times. The ban does not include the provision of other plastic bags for example, plastic packaging on fruit and vegetables. A legislated, independent authority that protects the community and the environment from the impacts of toxic and hazardous waste streams. Adopt appropriate Best Practice Environment Management (BPEM) guidelines for the siting and management of landfills in WA, along the lines of the BPEM guidelines issued by the Victorian EPA (available here). These guidelines should include clear advice regarding the siting of the landfills in relation to nearby sensitive flora and fauna populations and groundwater resources, as well as management of predator and scavenger species. Use the WAEC website to find both your electoral region and district then find the corresponding Legislative Assembly and Legislative council member below. Use the form below to send an email regarding the bill to your respective upper and lower house parliamentarian. While we are happy to provide a default letter, we strongly encourage you to add why you personally care about this issue. Personalise your email as much as possible. Start by stating that you're a local resident of your electorate, and explain why this issue: is important to you; affects your family and daily life; is particularly relevant to your local area. Your MPs take personalised emails from their electors much more seriously than pro-forma emails. You can also contact the Ministers directly from the contact pages on the WA Government website. A copy of your letter will be sent to this address.